Butterflies… | Who Are You Calling Crafty? Well today it hit 90 once again which means it rains every afternoon. Today I took the kids out to our little kiddie pool (very little kiddie pool) and let them play for a while. Jillian started talking about how she wants to study bugs, well mostly butterflies when she grows up. I thought that today’s rainy day project should be something easy and fun. So I decided on a butterfly sun catcher, Jillian thought that was a great idea but first she wanted to learn about ants. I Googled “learning about ants for kids” and found this website http://www.harrysbigadventure.com about ants. I’m sure if I would have put a little more thought into it I could have found a better site. I read Jillian all about ants. She then wanted to learn about butterflies and I found several great websites about butterflies The Children’s Butterfly Site and NOVA Jillian loved the butterfly show. I wanted to make something that would be fun and easy. I remember making “stained glass” in summer camp (our art teacher in elementary school had a lot to be desired, we never did anything that cool.) The “stained glass” was wax paper with melted crayons in between, then punched a hole for the string. Very easy and a lot of fun. 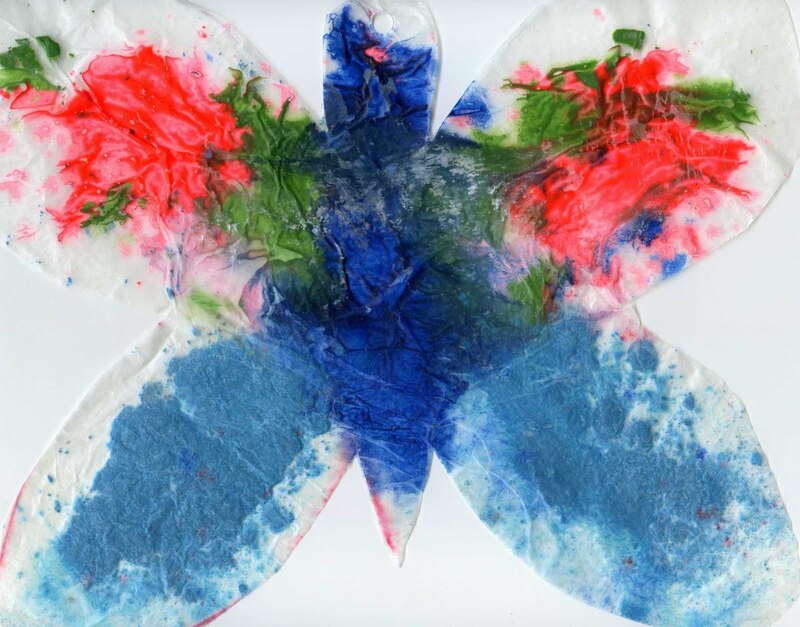 Fold one piece of wax paper in half draw have the shape of a butterfly on the wax paper. Unfold, place on top of towel and pour crayon shavings on the wax paper. Place the other sheet of wax paper over the shaving and put the other towel on top and iron until the crayon shavings are melted. Remove towel and let the wax paper cool. Once cooled let your child cut out the butterfly. Use hole punch to punch hole, attach string and hang proudly in the front window. Jillian working with the crayon shavings. Jillian showing me her finished butterfly. Where I hung the butterfly. The scan of the butterfly before I hung it up.